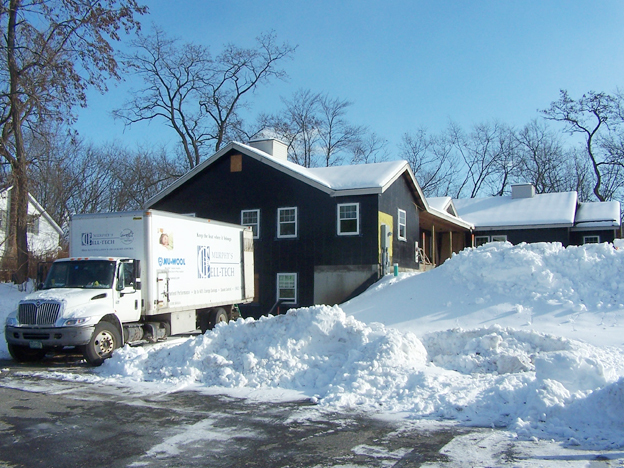 The Upper Valley Haven Adult Shelter, located in White River Jct Vermont, is a near Zero Energy Building. It's exceptional thermal envelope performance, coupled with it's gas heating mechanicals, and electric and lighting controls makes it exceedingly energy efficient. If a photovoltaic solar array was added it could easily become a net-zero project. Murphy's Cell-Tech was responsible for insulating the building, as well as providing comprehensive pressure plain integrity and air leakage control. Mechanical work was done by Thomas Enginnering. "The Hixon House provides shelter for homeless single men and women, and couples without minor children. The Shelter opened to guests in June 2010 and has room for up to 20 guests, with two guests in each bedroom. The building includes 10 bedrooms, staff offices, counseling rooms, phone rooms, check-in area, an elevator, computer room, kitchen, common areas for dining and recreation, bathrooms, laundry, and storage. The new Hixon House shelter provides a safe place for individuals and couples to stay while making positive changes in their life. This project is related to the Upper Valley Haven Family Shelter.